I have finally passed the half way mark on my P10P journey. 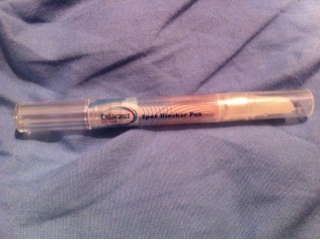 The product which has been used up this time is the Clearasil Ultra Spot Blocker Pen (Poundland). The Clearasil spot blocker pen was a bit meh. I used in on spots that were already formed and spots that were just under the surface ofthe skin. I didn't like that it had a sticky texture and once dried, it was still sticky. It didn't do much for the spots either, which makes me grateful that it was only £1! Do you have any remedies which are great for reducing spots?